This upsets President Obama. As you may have heard by now, Romney could not fit in an appearance with Nickelodeon. President Obama did find time in his busy schedule to attend the Nickelodeon special event. Romney finds time to meet with Prime Minister Benjamin Netanyahu. Remember Israel? Yeah, the country that is staring at a nuclear Iran whose mission is to blow all the men, women, and children in Israel into little tiny pieces? Incidentally, President Obama had no time in his schedule to meet with Netanyahu, but instead partied with Jay-Z and Beyonce. Remember that? That was around the time 20 American (our) embassies were burning around the globe while President Obama was tweeting about his big party with Jay-Z and Beyonce. That was around the time when President Obama was tweeting about sweatshirts for his re-election campaign at the moment they were loading our American men killed in Libya, now laying dead in coffins onto the plane to bring them back home. That was around the time on 09/11 when Obama’s first tweet was about his re-election campaign … no mention of the American loss of life back in 2001. That was around the time President Obama said a few words about Christopher Stevens – our American ambassador who was gang raped and murdered – and then the President flew to Las Vegas for his re-election campaign. That was around the time President Obama also compared murdered American officials in Libya to his Las Vegas campaign volunteers. That was around the time when the Obama administration was involved in a massive cover-up about what really happened in Libya and how unprepared they were and how horribly they handled the situation. So, let me get this right. Obama can meet with a station known for its cartoon characters but cannot meet with a head of state (Netanyahu) to discuss how to avert a national crisis that could lead to nuclear war … and Romney doesn’t meet with the cartoon station (instead he is talking to children on the campaign trail face-to-face) and does meet with Netanyahu … and Romney is the one making negative news? 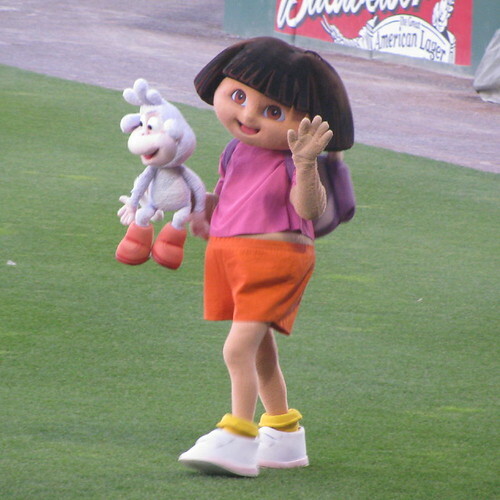 Who do you think is more important averting nuclear war or Dora The Explorer? This election is not about ideology. It is not about political parties. It is about individual people. Their decisions. Their priorities.